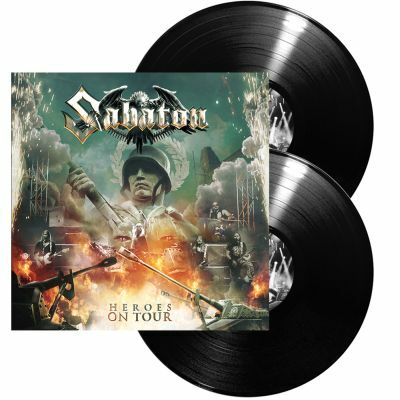 SABATON - HEROES ON TOUR VINYL (2LP BLACK) | Online Shop | Wizard LTD. Album: "HEROES ON TOUR VINYL (2LP BLACK)"
After the release of their latest, highly-acclaimed studio record, »Heroes«, Swedish heavy metal heroes SABATON hit high chart positions all over Europe, including Sweden (#1), Finland (#2) and Germany (#3). The »Heroes« tour has also been another step higher onto the throne of heavy metal: SABATON play even bigger and mostly sold-out venues all over the world and brought along the big guns… literally: For quite some time now the Swedes have been accompanied by the tanks Audi and Walther; with them, a merciless drumfire hits the crowd at every show. Both tanks were on stage during their headline concert at a sold-out Wacken-Festival in front of 85.000 people and during their concert at their hometown festival in Falun, Sweden, which the band organize themselves, too. These shows were big highlights of the »Heroes« tour so far. So the band decided to record both shows for an upcoming live DVD/CD package called »Heroes On Tour«. Pär Sundström commented: “We have always aimed to be a band people love to see live, for the simple reason we love to play live. With this DVD/Blu-ray release we hope to share some of that feeling with you. We recorded two shows in case one is not enough for you!ʺ Especially the Falun show was a big thing for the band. “That’s a very certain feeling. Most of all, considering we organized the entire three-day festival with the band. It’s simply something special,ʺ the bassist rhapsodizes. Beside those two shows, the package will feature extensive bonus content: A mini-documentary about last year’s SABATON festival in Gelsenkirchen, Germany is included on the first DVD. “2015, we arranged the Noch Ein Bier Fest in Germany. It was very successful and a beer tasting with our German fanclub was part of it. They should have a say in the choice of the official SABATON beer and it will be on sale this summer!,ʺ bassist Pär reveals. Additionally, you can see a performance of SABATON with the Bohemian Symphonic Orchestra Prague in Vienna, Austria in the bonus section. Last but not least the second disc allows fans to choose between the rehearsal version of the live set in the studio and the live performance on the mainstage in Falun.